I want to tell you about these beautiful gel liners by maybelline I adore them so very much my favorite is 03 blue I wanted a metallic blue gel liner but I couldn't find one so ended up getting this deep blue gel liner and girl it is beautiful both of them glides on easily and stays on put for literally 24hrs well I never wore them till that long but yeah say for about 15 to 16 hours yes they did stay put no smudging no mess. This gel liner is a girls dream come true comes with brush so you can try all kinds of look from cat eye to the regular simple liner this gel liner is solution for all. Highly pigmented !!!! if you don't believe me see the swatches below I wear blue more than black. They are not at all expensive you pay PKR 1100 i.e. $11 for this beauty or I must say a girls best friend. Disclaimer: "All opinions are honest and based on my true experience this is not a paid review"
I follow you in GFC, now it's your turn. Hey Maliha thank you for following me I absolutely love reading your blog. Wow! I cannot believe how amazingly pigmented these come out! 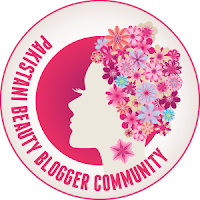 you dont have a facebook page or bloglovin'?? Love this liner! Very economical and does a job well!